Strangely enough, I can look at these notes, and remember everything that went on in this meeting. Well, not actual words people were saying, but who cares about that? Fidgets, furtive looks, awkward muffin bites, surreptitious nose rubbing, I have a photographic memory about the important stuff. That tells you a lot more about people than the words they say, which are colored by their own self-interest, on top of which they have ridiculously self-defeating notions of what their own self-interest is. So except for professional psychiatrists, who bring their own set of twisted perceptions to the table, there's no reason for any of us to pay the slightest attention to the words that escape kicking and screaming from their fetid oral cavities. 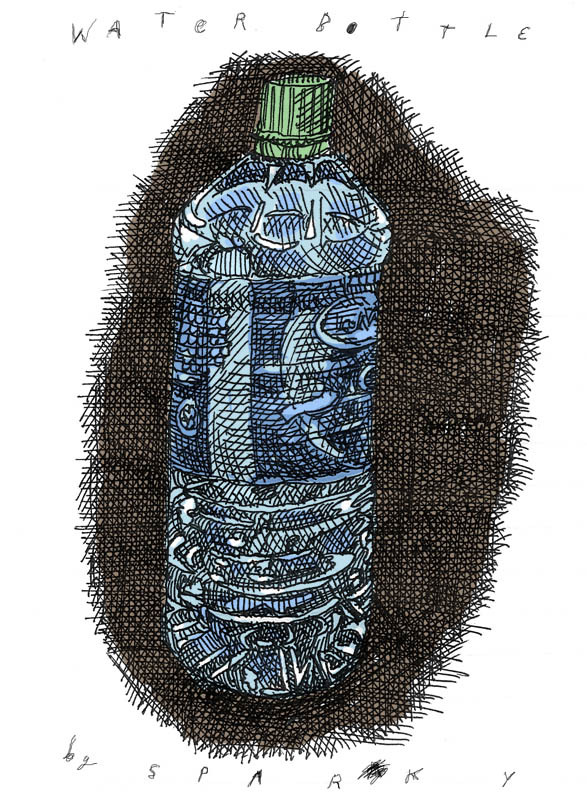 Hence the notes in the form of doodles of water bottles. This meeting provided the subject matter for today's entry in Crackskullbob, which makes it a whole lot more productive than most meetings. Now I can take the rest of the day off. July 13, 2006 by Walt Taylor.